Free Shipping Included! 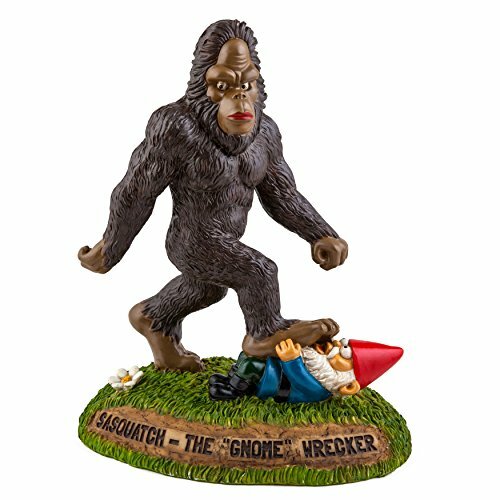 BigMouth Inc. Sasquatch the Gnome Wrecker Garden Statue, 9-inch Tall Funny Lawn Gnome, Perfect for Gardens by BigMouth Inc at The Net Stores Network. MPN: BM1769. Hurry! Limited time offer. Offer valid only while supplies last. Trampling through a garden near you! When you're 9 feet tall and 700 lbs, its easy to disregard the snap and crunch of gnome bones under your feet. Trampling through a garden near you! When you're 9 feet tall and 700 lbs, its easy to disregard the snap and crunch of gnome bones under your feet. When Sasquatch-aka the Gnome Wrecker-comes to your garden, give him some room to roam. COMICAL LAWN ORNAMENT: When Sasquatch comes to your garden, give him some room to roam! BigMouth Inc's The Gnome Wrecker Garden Gnome statue is a hilarious take on the conventional lawn gnome. This eye-catching garden statue is a funny lawn accessory that is sure to keep people laughing! WEATHERPROOF: This hand-painted ceramic garden gnome statue is made of durable cast poly resin so that it can remain outdoors and withstand the elements all year long. ACCENTUATES ANY SPACE: Standing approximately 9" tall, BigMouth Inc's The Gnome Wrecker Garden Gnome statue is not just limited to outdoor spaces. This one-of-a-kind sculpture accentuates indoor spaces like display shelves and offices, as well! MAKES A GREAT GIFT: The Gnome Wrecker Garden Gnome statue makes a perfect gag gift! This unconventional lawn decoration is a hilarious present for any gift-giving occasion. COLLECT THEM ALL: Spice up your garden, yard, or indoor space with BigMouth Inc's collection of one-of-a-kind garden gnome sculptures. From Ninja Gnomes to Selfie Gnomes you are sure to find the perfect lawn accessory to match your personality and meet your decorative needs! If you have any questions about this product by BigMouth Inc, contact us by completing and submitting the form below. If you are looking for a specif part number, please include it with your message.